Posted bydaniel	 9 March 2008 1 Comment on all i want is to eat your brains. I am at sxsw interactive. This is my second year. This conference gives me the ideas and the energy to try and make a place for myself in the web industry. This is Day Two, and the panels have been great (most of them), the people I meet and re-meet have made this a blast (most of the time), and in the same day I met Heather Armstrong (dooce.com) and Jonathan Coulton. I also walked past Mike Birbiglia but he was sitting at a table and I figured it would be like swooping down on a helpless rabbit who told really funny jokes, so I kept on walking. I’m not a fanboy. Right, I have an iPhone. Right, I wear Converse or Adidas shoes. But I have never a) stolen a set list and gotten it autographed, or b) told a famous blogger that my mother doesn’t like it when she uses the F-word. Until today. 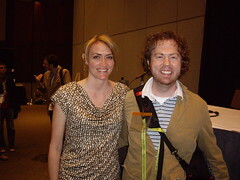 I started reading Heather Armstrong’s blog because of my aunt Tori and my mom. I suppose that reading a chick blog is not the manliest thing one can do. Especially one referred to you by your mom. I mean, I prudently wear boots, hunt deer, and spit a lot while I read it (for balance), but my sxsw friends were mildly amused at what I hope wasn’t too starstruck an expression on my face. Heather joined her friend-blogger Margaret Mason to discuss keeping blogging under control (“Content Boundaries, a 12-step Program“). Heather is great to hear speak. It’s refreshing to find that she talks like she writes, frankly and honestly. I especially liked when she switched places with me for our photo, to get on her good side. I respect that. 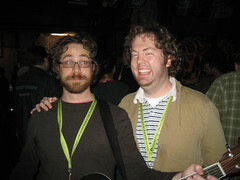 Jonathan Coulton got on my radar because of the portals song, of course. My oldest brother played it for me, and it is just brilliant. So I jumped at the chance to see him live. He gives a subtle but hilarious show that I enjoyed. And I’m hooked. I’m now a total fan. If my laptop had a battery that lasted longer than a very interesting 10 minutes, I would be putting more information about the cool stuff I’m actually learning here. That will have to come later, in a more distilled form.